Dads can be hard to shop for. Even finding him the perfect steak for the great Father’s Day barbecue you’ve planned can be a challenge if you’re not sure of his favorite cut. Harris Ranch comes to the rescue with this non-scientific guide that will help you match Dad’s personality to a satisfying steak he’s sure to appreciate. For recipes and tips on cooking your Father’s Day steaks to perfections, visit our beef recipes page.. If your dad has an appreciation for the finer things in life, the T-bone may be the cut for him. 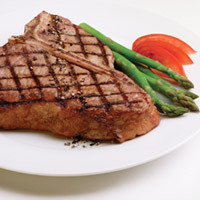 The T-bone is a large steak that includes meat from the two most prized cuts of beef, the tenderloin and the short loin. These are generally considered some of the highest quality steaks, and a perfect fit for a man who has a big appetite for the best of everything. This is a steak with many names: shell steak, club steak, Kansas City steak and more. No matter what you call it, this cut is one of the most popular and is considered an American steakhouse classic. It is cut from the short loin and is a muscle that does little work, making it very tender and easy to cook on the grill or in a pan. Dads who like to relax in their well-worn jeans, enjoy a good football game, and who like apple pie for dessert can appreciate this steak. The translation from French means “cute or dainty fillet”. While that doesn’t sound very “manly”, the thickness, and the melt-in-your-mouth tenderness this steak can satisfy even the heartiest of appetites. 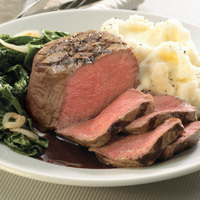 Filet Mignon is one of the most tender cuts of beef, and also the most expensive. It is a good choice for dads who aren’t afraid to spend money on good quality, who value the finer things, and takes good care of them, including their families. 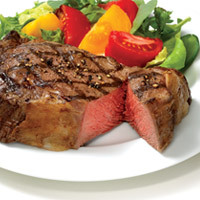 A rib-eye steak is boneless and usually has excellent marbling in the meat. The flecks of fat give the meat just the right mixture of hearty flavor and buttery tenderness, even if you grill it to medium-well. This steak is perfect for a man who is full of character, tender on the inside, and has a forgiving heart. This cut comes from the abdominal muscles, a strong, well-exercised part of the cow. 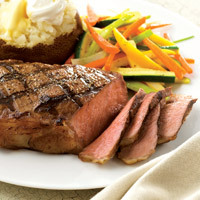 It is a long, flat cut of meat that is often marinated or rubbed, then seared on the grill and cut across the grain to serve. 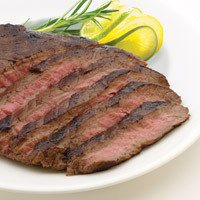 You’ll find flank steak in dishes throughout the globe including Mexican fajitas, or Chinese stir-fry’s. This cut is for dads who are health-conscious, work out regularly, are well traveled, and who get along well with others. Harris Ranch Beef is available in specialty markets, Lucky Supermarkets and coming soon to Save Mart stores throughout the western United States. Or customers can have Harris Ranch Beef shipped right to their door by placing an order at 1-800-942-BEEF, extension 638.